Page of Cups Tarot Card Meaning - All Explained HERE! The Page of Cups represents yourself as a child, how it felt and what you did, as well as all the emotions and feelings that come flooding back from thinking about your past. Past – The Page of Cups in the Past position can clearly state your childhood, if that is of any importance. If you’re focusing on the recent past, it relate to a particular event where you experienced a sort of childlike curiosity or possibly naivety. For better or worse you might not have understood a situation and the whole thing went over your head. The Page of Cups may also relate to a time you stated a creative project, likely something tied to your passions. 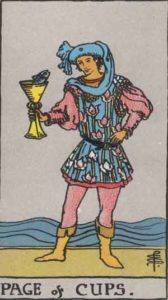 Present – The Page of Cups in the present position has a few interpretations. If you have children, expect a significant upcoming event. Maybe they’re starting to walk or talk, it’ll be memorable. If you don’t, expect to get acquainted with somebody younger than you. They might be able to show you a new perspective on life, or help you refocus on something you’re concentrating on completing. You might be able to give advice to those looking for guidance. Expect something sudden to happen in any case. Future – The Page of Cups in the future position can mean that you’re currently not grasping 100% what you’re doing, but for whatever reason, you’re doing okay at it. Don’t worry, in the future you’ll understand. It might signify a period of relaxing and leisure in the near future, an upcoming holiday or break period. There is a chance that a mentor will appear out of nowhere to give you advice, so be open to all possibilities. Work / Education – The Page of Cups in regards to work or education gives you hope that these things that are considered ‘serious’ are going to be broken up with a period of leisure. You might even need a change in your life. Are you doing what you want to do, or what you feel you need to do? it’s likely that inspiration will come from the unlikeliest of places, especially if you’re feeling stuck in a rut at the moment. Romance – The Page of Cups in romance can mean that you should look for someone younger than you if you’re single. Is your current partner younger than you? Someone might come along soon that you become completely enamoured with. Expect surprises or a certain change if things have been stagnant for a while, whether single or currently taken. It might be time for you to express your emotions, especially if you’ve been holding back. This could mean confessing to a crush, or telling your partner how you feel if something has been bothering you. There could be somebody from your childhood, or younger years, who is now very suitable for you. Friends – The Page of Cups in regards to friendship means you might need to associate with some people younger or more inexperienced than you. Maybe a younger sibling might make a great person to talk to now. If you’re in a club or working, try talking to people who have joined recently. Look to mentor those younger than you, they’ll look up to your experience and knowledge. You might meet somebody spontaneously in the coming weeks, treat them as a new friend if you can. Money – The Page of Cups in regards to finances isn’t clear cut. Know the value of money. Would you entrust your bank account to a child? Sometimes children have a great, clear vision of the world. Think simple. It’s possible that you’ll think of a new way to make money soon. Maybe you can make money from your hobby, or something you can do in your spare time, possibly something you used to do as a child. Health – The Page of Cups reminds you to listen to your body. A child complains when something is wrong, but as we age, we don’t complain so much. Don’t ignore what your body is telling you! Something unexpected may happen soon, which could affect you mentally or physically. It might seem like it’ll come out of the blue, so watch out for any potential accidents you could be prone to. Spirituality and Mentality – The Page of Cups in spirituality can mean that you need to simplify things. Nothing needs to be so complex. Can you boil it down to a Yes or No answer? Are you thinking about something a lot, even though there are only few outcomes anyway? Try to get back into beginners mind, it might be a good idea to look to a whole other area of spirituality for insight. In reverse, the Page of Cups can represent the lack of inspiration, and shutting yourself off from potential avenues. Many of us consider ourselves to be unlucky, but for a lot of us, this simply means we do not takes the opportunities given. Learn to say yes. Say yes to things offered to you, especially if you’re somewhere new, it can be an exciting path to follow, especially if you’re usually a closed off person. We’ve selected live tarot readers to give you a FREE 3 Minute interpretation of The Page of Cups! Scroll through them below and pick your favorite one.